The only word I find to describe Ms. Jayanthi Natrajan is – fool. Her diatribe, which she issued to Mrs. Sonia Gandhi in her letter or those media hawks in a press conference, are nothing but a classic case of frustration wrapped in hegemony. I call it frustration because; the lady brought the wrath on herself by remaining too loyal to the Gandhi family. Though she finally realized her mistakes, it is a case of ‘too little too late’. If not her intellect, Ms. Natrajan should have consulted history to see how the Gandhi family is in a bad habit of ditching and at times even humiliating those who support them, for nasty political benefits. This culture in Congress has gone worse after the advent of the mother-son duo at the helm of affairs. It is only a matter of time that Ms. Natrajan got the bitter treatment but in all likelihood, she must be a party to similar treatment to someone else during her good rapport time with party high commands. Ms. Natrajan can cry her way to as many media conferences she wants but the ground reality with Congress remains as rotten as it used to be during the times of Nehru and I am not expecting much to change after today either. Ms. Natarajan can’t even complain of not seeing the writing on the walls. As early as 2013, Congress high command dished out yet another masterpiece of ditching a party loyalist. Just because an emerging Shiela Dixit could have turned out a nemesis for Rahul Gandhi, Congress sycophants worked in background to sabotage her chances in the last assembly election. That time also, I had predicted the outcome is because of an overtly jealous Rahul Gandhi office working overtime to safe guard the prince’s alter ego. That time it was the turn of Shiela Dixit to face the heat of the highly self-centered Congress high command and now, as it turned out, is the time for Ms. Natarajan to face the same heat. Only difference is, Ms. Dixit at least got away with some respect by adorning the post of the governor of Kerala whereas Ms. Natarajan was simply thrown out of the equation without any face saver. It is quite natural for Ms. Natarajan to feel cheated but the fact is she realized it at the end of the day. Her passionate letter to Sonia Gandhi may possibly never cover the truth in the matter that, for Congress, nothing comes before the Gandhi family. For starters Ms. Natarajan sounds like begging though the treatment mated at her deserves a logical outburst. I totally get the frustration here. Someone as loyal, or at least to the tune she is claiming to be, deserves better treatment from her masters. I call Gandhi family as the masters of the entire party because the sycophants therein don’t know how to run a politically elected party. Like a king to the throne, the Gandhi family members remain their perpetual heads whereas hardworking people are either put to oblivion or forgotten totally. This is the underline understanding in the party that, nothing can synonym with the party other than the Gandhis. While Ms. Natarajan can cry for her ruined family name, she must not forget a certain Narasimha Rao and how his dead body wasn’t allowed inside the party headquarters, just because he happened to be a successful PM from the Congress block. PVN successfully made a name for himself in the party and that is not tolerable for the Gandhis. Shitaram Keshri is another prominent example that must strike a chord with Ms. Natarajan and her feelings. With such glaring examples to refer, Ms. Natarajan must have been more faithful to her words than expecting Sonia Gandhi to consider her pain. After giving an autobiography of her life and career as a loyal Congress worker, Ms. Natarajan moves to the day when she was asked to resign. To recall the sequence of events, I would like to record, that I was carrying out my duties as Minister of State (I/C) Environment and Forests in the routine course, when suddenly that day on December 20, 2013, the then PM, Dr. Manmohan Singh summoned me to his office. When I entered he stood up from his chair, looking tense and grim, and uttered these exact words. 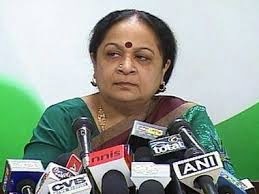 He said "Jayanthi, I have been told by Congress President, that your services are required for party work." I was puzzled, and I said, "Yes Sir. So what should I do?" He replied, "She wants you to resign." I was shocked and said, "Resign Sir? But when?" He replied "Today." I once again asked him if this was what the Congress president wished. He answered in the affirmative. Unsuspecting, and trusting you totally, I did not utter a single word, but smiled at him and said I would comply with the wishes of the Congress President. Forget the pain of Ms. Natarajan for a moment. The annoying thing here is the behavior of Manmohan Singh. If we have to go by Ms. Natarajan then the PM back then was as a puppet as one can be. More than Ms. Natarajan it was the irony of India that we had a PM who was totally out of his own authorities. By the looks of the letter, Dr. Singh was never of the opinion to sack Ms. Natarajan but he had to bow down before the wishes of someone who at best was a bartender for qualification. “She wants you to resign”, Dr. Singh ought to have said. Now the question arises here is – who is she to decide who should there be in the government? Isn’t it the lookout of the PM to decide how his cabinet should look like? With what authority our democracy was allowed to be subverted to such an extent? I don’t care how Sonia Gandhi decides to treat her sycophants but I have a lot of objections when a clueless woman sabotages the very ethos of our democracy so nonchalantly. And look at the impotent PM in the entire cycle where he lets his cabinet function on the wishes of an uneducated ex-bartender. Expected is the exact explanation. When absolute non-deserving idiots with no qualities to write home about are placed at the position of decision making, these are the precise outcome one can expect. But there is something more disturbing than just Rahul Gandhi in the entire scheme of things. And the disturbing notion is the attempt of Congress party and the so called Rahul Gandhi’s office to uphold the nonexistent intellect and repute of one jerk of an individual in exchange of both party loyalists and to some extent even the nation. Just because Rahul Gandhi had to sound as a delivering politician and an intelligent orator, the party consults their dirty tricks department to plant stories in the media. Just because RG wanted to appear talking sense for a change in FICCI, the likes of Ajay Maken and Digvijay Singh were asked to explode out of their outerwear to blabber left-right-and-center. Here another dangerous precedence comes to play other than Sonia Gandhi’s wishes in government functioning. It is now clear that the government also functioned in a way so that Rahul Gandhi will appear as a serious politician. I agree, a useless bot like RG needs all the pushing to remain relevant in our political discourse but in exchange of national interest? Who again allowed Rahul Gandhi to take flabbergasting decisions in government functioning when he even wasn’t a cabinet minister in the government? The sycophants must also note here that just because Rahul Gandhi should sound intellectual in FICCI, the selfsame selfish lot at the top sacrificed a seasoned party loyalist just like that. I am sure Ms. Natarajan is not the first case, neither this would be the last, as long as these clowns keep on sagging their tails before the Gandhi family. Now Ms. Natarajan goes ahead explaining how Congress as a party has lost all vision and sees itself as a party that must anyhow attack Narendra Modi to remain in news. Despite the fact that I initially refused, because I thought that the party should attack Shri Modi on policy and governance and not drag an unknown woman into a controversy, Shri Ajay Maken telephoned me on November 16, 2013, while I was on tour and asked me to come to Delhi immediately to address a press conference on the issue. I expressed my disinclination to do this, and refused the assignment, mentioning that I was a Minister at that time, and this should not be taken as the point of view of Government. I suggested perhaps an Official Spokesperson should do the Press Conference, if so desired. Shri Maken told me once again, that this was a decision taken at "the highest level" and that I had no choice in the matter. After the press conference throughout the controversy which followed I was told by Shri Maken to fiercely attack Shri Modi, on TV channels and during debates, although I was otherwise never fielded in the media after appointment as Minister. Another dangerous precedence. How many times we have seen these jokers crying wolf and advising all to refrain from personal attacks in politics? People asking genuine questions about Sonia Gandhi’s and Rahul Gandhi’s qualification becomes a personal attack but the same clowns would be head-over-heels in churning out hysterical stories to attack NaMo somehow. Case in point is the spokespersons of the party who regularly appear on television. No one of them would be eager to talk on issues or even talk anything logical. Whole effort would go in to defend the Gandhis by any means. That is perhaps why we have absolute nutcases like Sanjay Jha that swarm our drawing rooms during prime time. The loyal devotees of the party only see Gandhis everywhere. If the sun rises from Nehru’s posterior in Ramachandra Guha’s world, it seems to rise from Rahul Gandhi’s posterior in Sanjay Jha’s world wherein Manishankar Aiyer in between has his own world where the sun rises from Rajiv Gandhi’s posterior. Such devastating are the psychological balances of these jokers that they forget something integral to any human being – self esteem. In such an environment, expecting a genuine spokesperson in Congress party is as a wishful thinking as expecting a single honest person in BCCI. Ms. Natarajan may shout of her integrity now but the environment as rotten as that of Congress party is a creation of sycophants like her only. All knew the snoopgate thing is a spin master’s doctrine with no substance or logic behind it but the Congress party and their spokespersons like Ms. Natarajan kept on shouting for a month. Fiercely attack Modi, as directed. Interesting, no? But, once a liar is always a liar and I don’t see any reason why I should believe Ms. Natarajan here since she was as awful a Congress spokesperson as the rest of them were. Next paragraph from Ms. Natarajan explains how Rahul Gandhi even interfered in mistrial functioning. I received specific requests [which used to be directives for us] from Shri Rahul Gandhi and his office forwarding environmental concerns in some important areas and I took care to honour those "requests." Shri Rahul Gandhi went in person to Niyamgiri Hills in Odisha, and publicly declared to the Dongria Kondh tribals that he would be their "sipahi" and would not allow their interests to suffer at the hands of mining giant Vedanta. His views in the matter were conveyed to me by his office, and I took great care to ensure that the interests of the tribals were protected and rejected environmental clearance to Vendanta despite tremendous pressure from my colleagues in cabinet, and huge criticism from industry for what was described as "stalling" a Rs. 30,000 crore investment from Vedanta. In fact you have yourself conveyed your concern in this regard in letters written to me. In several cases including the stalled GVK power project regarding the Dhari Devi temple in Himachal Pradesh, the Lavasa project in Maharashtra, the Nirma cement plant in Gujarat and in several other cases I was given specific input, to make my decision. Apart from this Shri Pulok Chatterji, Principal Secretary to the Prime Minister was in constant touch with me, and officers of the Ministry in guiding the decisions to be taken by the Ministry at that time. Who on earth gave Rahul Gandhi the liberty to issue specific requests? And, on what ground our ministers in UPA government should oblige any such unconstitutional activities? I see a criminal in Ms. Natarajan right here. She perhaps sowed the seeds of disaster when she agreed to accommodate Rahul Gandhi’s nonsense. Concern about environment is one thing but to be concern about somebody’s blabbering in front of tribals in Niyamgiri and that too going against the environmental policies is quite another. Vedanta was booed out because Rahul Gandhi wanted so while Jindal had their cake for being too close to same Rahul Gandhi. The investments of Vedanta were rejected, which possibly could have generated a lot of jobs and our environment ministry headed by Ms. Natarajan became a mute spectator of the farce so that Rahul Gandhi would look like a serious politician. I am sure Vedanta is not the only case. Vedanta might be one example that Ms. Natarajan cited but in reality there could be many projects that perhaps would have stalled to make Rahul Gandhi appear a tough decision maker. That is perhaps why the cylinder limits were increased to 12 from 9 immediately after RG passionately vouched for common man’s plight in AICC annual congregation. See, the idea was not to give relief to the middle class but to make Rahul Gandhi appear as an influential leader. Not only the son, in fact the mother was also overtly advocating her vested interest through government channels. The matter of commission and omission becomes scarier when Ms. Natarajan elaborates how an uneducated Vatican disposes her wishes on other economic projects with heavy financial impact. Having said that, why would one believe Ms. Natarajan? She was no different from an average Congress mule. During good times, Ms. Natarajan even left insanity bankrupt on many occasions. And to rubbish Ms. Natarajan and her filthy victimhood, she herself was too shameless to put Gandhi family’s concern above national concerns. The so called environment can go for a walk was the norm during UPA tenure, it looks like. I can go on but that would sound repeating the malaise in the then UPA government, which we all unfortunately know. In nutshell, the government back then wasn’t run with respect to national and public interest but with respect to Sonia Gandhi and Rahul Gandhi’s concerns. Ministry of environment can’t just be the exception here. I am sure most or it could be all ministries that were sabotaged by the Gandhi family to remain relevant in our political sphere. It is a co-incidence that the once famous #JayanthiTax came out in open to defend her but in all likelihood all ministers in UPA government were doormats to the Gandhi family households and took orders on daily basis for their day-to-day functioning. Gross unfortunate part was that the case of our then PM Dr. Manmohan Singh. He in fact led the procession of these sycophants in displaying unimaginable shamelessness in public discourse. Hope the mice like Ms. Natarajan are in plenty in Congress and in time to come, all will let open many more can of worms before ditching the sinking ship called Congress.